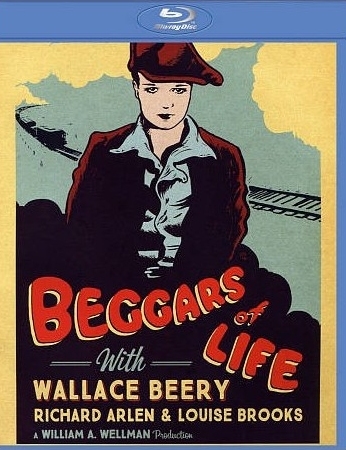 Wallace Beery may be the star, but it’s the fascinating Louise Brooks who grabs the focus of Beggars of Life, a rough-and-tumble tale of impoverished vagabonds and their steely will to survive. Produced in the twilight of the silent era, this gritty, often poetic film still packs a punch. The name Louise Brooks may not mean much to contemporary movie fans. Her brief career all but ended nearly 90 years ago and her handful of films, almost all of which are silent, aren’t readily available. But you’ve probably seen her image, which came to symbolize the frenetic Jazz Age of the 1920s. Her short-cropped, pageboy bob became a hairstyling sensation, and her pouty demeanor gave her an air of exotic mystery and androgynous allure. She’s best known for starring in a couple of German films directed by G.W. Pabst, most notably the provocative Pandora’s Box, which she made after an ugly split with Paramount Pictures. Effectively blacklisted in Hollywood thereafter, Brooks disappeared from view for decades until a successful memoir revitalized interest in the actress and gave her a mythic, Garbo-like aura that has lingered to this day. Beggars of Life was the last film Brooks made before telling Paramount to shove it and leaving Hollywood, which she reportedly loathed. Beautifully restored for this Blu-ray release from Kino Lorber, the film documents Brooks’ considerable talent and proves that she’s more than a hairstyle and smoldering presence. Directed by William A. Wellman, who a year earlier helmed Wings, the first ever Best Picture Oscar winner, and would go on to direct such classics as The Public Enemy, the first version of A Star Is Born, and The Ox-Bow Incident, Beggars of Life is a well-made curio that tackles some potent issues that still strike a chord today. It also reminds us just how powerful and artistic silent films can be. The story is simple. A wandering hobo (Richard Arlen) knocks on the door of a man’s home hoping for a handout. When the homeowner doesn’t respond, he lets himself in and soon discovers that the man has been shot dead. A young woman (Brooks) soon appears and confesses to the killing. The man was her lecherous stepfather, who continually tried to force himself upon her. The hobo takes pity on her and convinces her to dress as a boy and flee before the murder is discovered. The pair go on the run together, hopping freight trains, sleeping in haystacks, and stealing whatever food they can get their hands on. As time passes, they grow closer, but an encounter with another gang of tramps – and the bullying leader (Wallace Beery) who’s determined to make the girl one of his conquests – jeopardizes their escape and sets up a dramatic climax. Beggars of Life resembles later films like They Live by Night which showcase tender romances between troubled misfits struggling to exist on society’s fringe; good people who’ve been dealt a bad hand and must make the most of it. Though themes of sexual abuse and harassment loom large, they never overshadow the human elements that fuel the tale. Wellman employs many techniques to wordlessly tell his story (title cards are used sparingly until late in the movie), the most stunning of which is a flashback of the murder that’s superimposed over Brooks, who intensely relates the incident to Arlen. A macho man who made macho films, Wellman displays a surprising amount of sensitivity here, and seems duly affected by his characters’ desperate plight. Silent films really spotlight a director’s artistry, because they’re all about the image. The lack of dialogue forces the filmmaker to find creative and visually stimulating storytelling methods and maximize the impact of editing. With Beggars of Life, Wellman proves once again, as he did so brilliantly in Wings, how inventive and dynamic he could be. The film isn’t a silent icon, but it’s probably Brooks’ finest Hollywood picture and an intriguing rarity that classics fans should find fascinating. Beggars of Life is 90 (that’s right, 9-0) years old. We’re lucky it exists at all, and we’re especially lucky it has been so lovingly restored by Paramount and Kino Lorber. This digital presentation was culled from 35mm celluloid elements preserved by the George Eastman Museum and it looks very good indeed. Plenty of print damage remains, but the image is quite clear, contrast and gray scale variance are solid, and the frame remains remarkably stable throughout. The modern music score, which supposedly contains selections from the original 1928 Paramount cue sheet, is presented in DTS-HD MA 2.0 stereo and sounds crisp and full-bodied. Interestingly, Beggars of Life, which was produced just after The Jazz Singer revolutionized the film industry, originally contained a few brief sound and dialogue elements, making it Paramount’s first quasi-sound production. Sadly, those elements appear to be lost and are not included in this Blu-ray presentation. Supplements include two audio commentaries – one by the director’s son, William Wellman Jr., and one by Thomas Gladysz, founding director of the Louise Brooks Society – and a 12-page booklet featuring stills from the movie, a cast and crew listing, and an essay by Nick Pinkerton.